Future Energy Systems competitors in the 2018 UAlberta Falling Walls Lab: Irum Zahara, Stephanie Ibsen, Miles Skinner, Fatemeh Bakhtiari Ziabari, Ankit Mathanker. 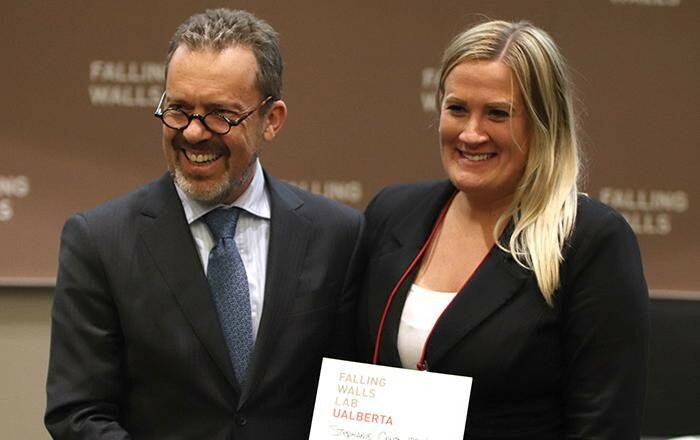 Future Energy Systems was well-represented last night at the fifth annual UAlberta Falling Walls Lab –– one of the only competitions of its kind in Canada. 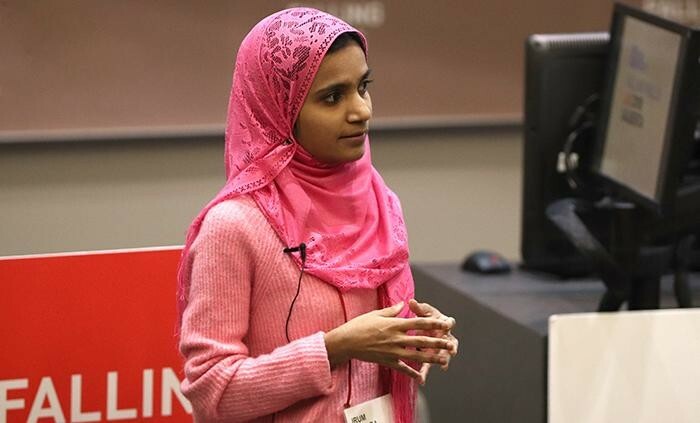 Part three-minute thesis, part TED Talk, part Dragon’s Den pitch, the competition offers young researchers the chance to present their wall-breaking ideas to a jury including representatives from academia, industry, media and government. The top two presenters are sent to Berlin to pitch their ideas at the international Falling Walls Conference. Future Energy Systems students represented 17 percent of the applicants to this year’s competition, 33 percent of the finalists, and 50 percent of the UAlberta delegation that will travel to Berlin. Presenting Future Energy Systems research in the final were Irum Zahara, Ankit Mathanker, Fatemeh Bakhtiari Ziabari, Miles Skinner and Stephanie Chute-Ibsen. Stephanie placed in the top two, and will join cancer researcher Douglas Brown in representing the University of Alberta in Berlin this November. Future Energy Systems congratulates all participating students, and thanks each of them for their dedication to communicating research to a wider audience. Special congratulations and very best wishes are extended to Stephanie as she prepares to represent Future Energy Systems and the University of Alberta on the world stage! Below are brief summaries of each student’s idea, with links for more information. Decontaminating water impacted by energy production is vital to human health, and Irum is part of a Future Energy Systems team that is pioneering the use of chicken feathers for water purification. 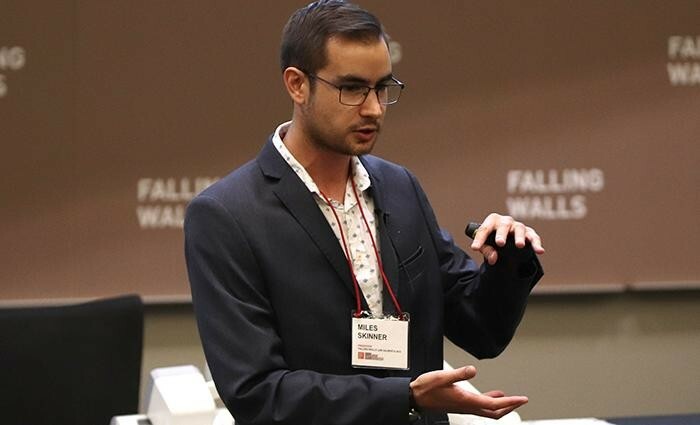 Irum impressed the Falling Walls jury and audience with the possibility of using an agricultural waste product to remove upwards of 90 percent of heavy metal contaminants from tailings pond water. Read more about her research here. The internal combustion engine has helped define modern society, but the fuel that drives it emits greenhouse gases that have vast environmental implications. Renewable biofuels might be the answer: engines can burn them without much modification, and because they are produced from plant sources, they simply recycle carbon dioxide from the air -- no net new carbon enters the atmosphere. 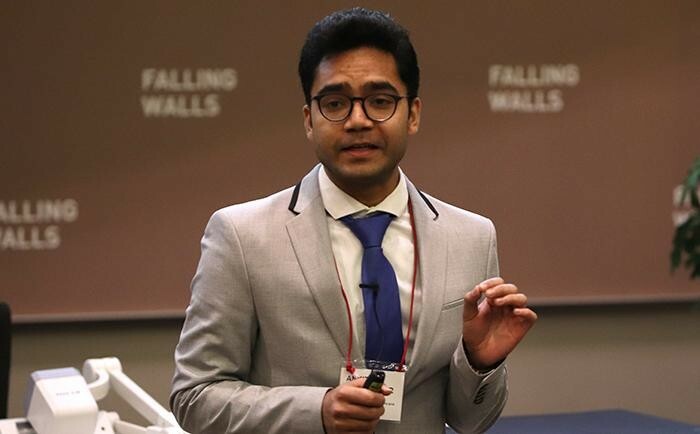 Ankit is part of a Future Energy Systems research team working to improve the practicality of biofuel production by making it possible to pipeline biomass feed stocks to the refineries where they’re turned into fuel. Learn more about that project here. Methane is a much more potent greenhouse gas than carbon dioxide, and it is released by numerous energy and agricultural operations. 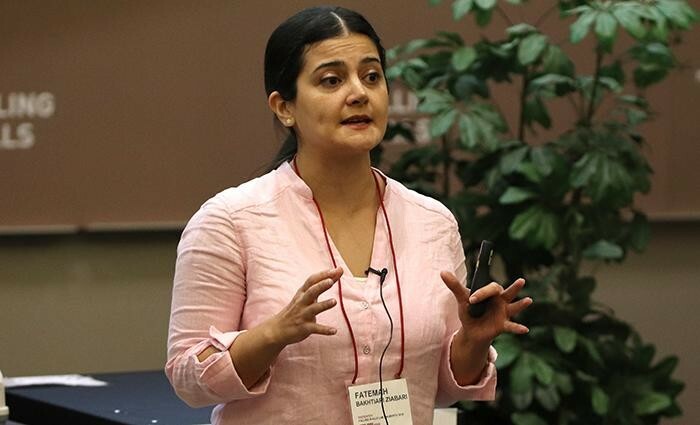 Fatemeh works with one of Future Energy Systems’ biomass research teams to genetically engineer a type of bacteria that will consume these methane emissions and convert them into useful products like bioplastics or jet fuel. More about that work can be found here. Improving efficiency and lowering costs for new energy technologies is vital to integrating them into our existing infrastructure. As part of his Future Energy Systems research, Miles develops hybrid materials that make new technologies possible –– like resin and iron composites that allow energy storage devices like flywheels to be spun up magnetically, massively increasing their efficiency. Learn more about the development of these storage technologies here. To understand if a land reclamation site has truly been restored, you can monitor its soil and vegetation. However, those two well-understood metrics might not tell the whole story, so Stephanie is testing a new metric: invertebrate populations. Tiny creatures like mites, insects and worms are very sensitive to soil quality, so by tracking their presence in sites that have been reclaimed after human disruption, it might be possible to get a clearer picture of whether restoration efforts are succeeding long before the vegetation would make it obvious. A profile of Stephanie and her work will be shared on this site next week.